The magnificent Great Synagogue in Florence, one of the most beautiful in Europe, was established thanks to the money donated by David Levi, a member of the local Jewish community. His legacy culminated a long fund-raising campaign started already in the 1840, following the opening and destruction of the Florentine ghetto. The synagogue, built according to the plans of architects Marco Treves, Mariano Falcini, and Vincenzo Micheli, winners of the competition published by the Community Council in 1874. The construction continued for eight years between 1874 and 1882 within a public park on Via Farini, in the Santa Croce district, not far from the historic center of the city. The inaugurating ceremony on October 24, 1882 was attended by many notable personalities, among them Rabbi Jacob Maroni, then the Chief Rabbi of Florence. The synagogue is an example of the new monumental building that expressed the change in the way of life and thinking of European Jews during the Emancipation. After the French Revolution (1789), Western and Central European Jews were gradually granted civil rights; they were allowed to travel freely without special permits, and many new financial and social prospects were open to them. The Jews looked for ways to express these changes: the hundreds of synagogues built throughout Europe during the 19th century are impressive evidence of this desire. The builders of these synagogues were not longer restricted as to location and height, and had no fear sounds of worshipers at prayer would anger the non-Jewish inhabitants or government. Majestic buildings erected in the city centers testified to the Jews’ efforts to be accepted as equal citizens in the society around them and to become part of its culture. It was a display of power by an affluent and liberated community. 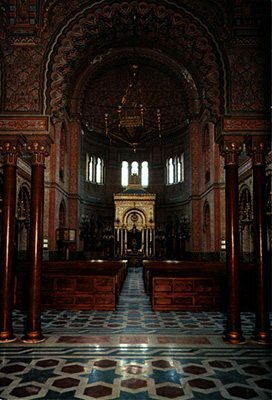 First in Germany and later in the rest of Europe, outstanding architects vied with others for the chance to design synagogues, and there was much debate about the choice of style. Motifs from the past and a mixture of styles predominated at that time in European architecture. The most prevalent trends were neo-Gothic-Romanesque and the “Oriental”. Those who championed the Oriental influence, which was noted for its horseshoe arches, believed that this style was a true representation of the Jewish people and its Eastern origins. 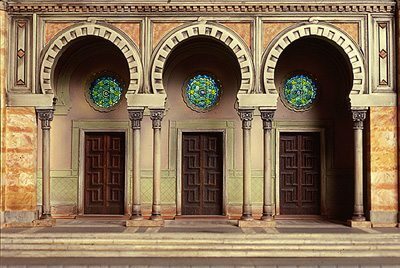 As it was intended to serve the local Sephardi community of Florence, the design selected for the Great Synagogue of Florence includes many architectural motifs that have been borrowed from the Moorish traditional architecture of Spain. Marco Treves, the only Jew among the team of architects, is thought to have been the main artistic force of the three, although some professors of the Florentine Academy were also consulted. On top of the Great Synagogue of Florence is an massive central dome that rises to a great height inspired as many other elements in the building by the edifice of the Hagia Sophia church in Constantinople (Istanbul). The façade uses two distinct types of marble in order to harmonize with the surrounding architecture and has two octagonal turrets, between which are three horseshoe-arched entrances. The windows and arches of the interior and their ornamentation are also reminiscent of the Moorish style, while the motifs appearing throughout the structure are inspired by a variety of sources. However, the general impression is one of a mostly Moorish style structure. The interior was painted by Giovanni Panti, a local artist. The decoration uses gold plating to enhance the Moorish style motifs, in addition the building boasts inlaid marble floors, rich mosaics and stained glass windows. 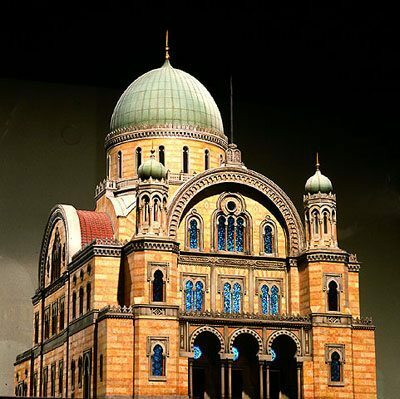 The Bimah, on a raised structure, stands in front of the Holy Ark. The wealthy community that built this synagogue was first established in 1437, when Jewish financiers were invited to settle in Florence under the protection of its rulers. The Jews became moneylenders, merchants and dealers in foreign trade. Many worked in the learned professions, especially medicine, and Jewish doctors were registered in the physicians and pharmacists association. Jewish cultural life in the city was influenced by the achievements of Florentine culture; at the start of the modern era, Jewish literature and Jewish learning flourished. Upon the incorporation of Tuscany into the Kingdom of Sardinia in 1859, Jews received full rights as citizens. In 1899, the rabbinical college was transferred from Rome to Florence, under the leadership of Rabbi Samuel Hirsch Margulies, and the community became a center of Hebrew culture in Italy. 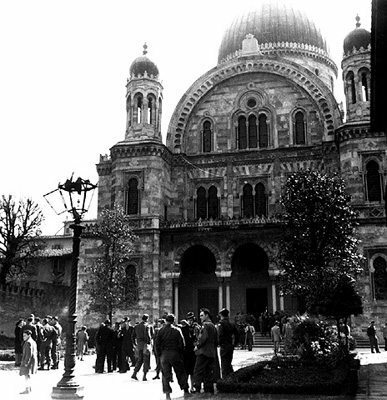 Jewish Soldiers from Eretz-Israel in front of the Great Synagogue of Florence, Italy, 1945. Photo: Josef Michlin. The synagogue was damaged in August 1944 when the retracting Germans and Italian Fascists tried to destroy it. Their plot failed mainly thanks to Italian partisans who managed to diffuse most of the explosives. After WW2 it was renovated and restored and is open to worshipers, but even today bayonet marks are evident on the doors of the Holy Ark, dating from the WW2 days when the building was desecrated and used as a stable and warehouse. A stone monument outside the synagogue commemorates the names of 284 Jews deported from Florence during the Holocaust. The furniture, frescoes, the library and all 90 Torah scrolls suffered greatly when the synagogue was again damaged during the catastrophic flooding of 1966. It was later restored thanks to contributions from many communities in Italy and abroad.